Looking at the programming history of the Food Network, Good Eats probably can’t lay claim to the title of the network’s most popular show, nor its most important one—Emeril Live, Iron Chef, and even Chopped are all arguably more integral to the channel’s growth and development over its 20-year history. Spanning 14 seasons and some 250 episodes, it could be called the channel’s longest-running show, but the vagaries of production schedules mean other shows best it in terms of episode count (Emeril Live’s 1,000-plus) and number of seasons (Diners, Drive-Ins, And Dives’ 17 complete seasons), so longevity is relative in this case. But setting aside such superlatives and looking only at content, Good Eats might just be the platonic ideal of Food Network programming: a perfect balance of instruction, education, and entertainment. When it launched as the Television Food Network in 1993, the nascent cable channel put a tight focus on cooking instruction: people standing in front of a stove and walking viewers through a recipe. In recent years, however, it has tipped hard toward food as entertainment, with an emphasis on reality and competition-style formats, relegating what remains of its instructional cooking shows to a daytime programming block called “In The Kitchen.” Educational programming looking at the history, production, and cultural impact of food is sprinkled throughout the network’s programming history, the most notable probably being the Marc Summers-hosted Unwrapped—thought that’s always been more of a background player. Good Eats—along with the show it debuted alongside in 1999, Iron Chef—bridges the two major eras of Food Network, while remaining unmistakably its own entity. Unlike so many shows on the network, which repurpose similar ideas under new personalities or slightly altered gimmicks, Good Eats has spawned no true imitators, at least on its parent network. (Its spirit lives on in many of the countless online cooking programs that have sprouted up in recent years.) 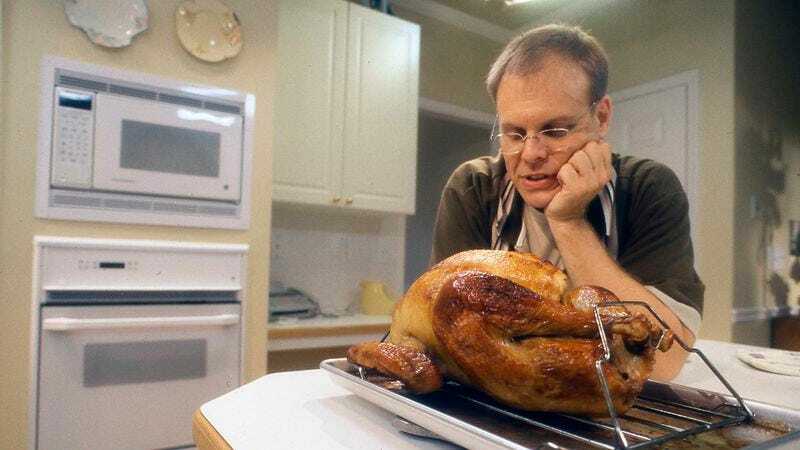 The closest approximations are probably the other programs and specials that Good Eats creator and host Alton Brown has hosted over the years, but with the possible exception of his residency as commentator/know-it-all on Iron Chef America, he’s most closely associated with the series that cemented his place on the Mount Rushmore of Food Network personalities. More than any other TV outlet since the VJ era of MTV, Food Network fosters and perpetuates a roster of “personalities”—cooks and on-air talent who stick around the network for years, slotting in and out of series as hosts, judges, commentators, guests, or whatever other good use they can be put toward. The network calls this the “Food Network Family,” a cuddly term for what’s essentially a shrewd marriage of the company’s programming and branding departments. (It’s a model that’s been extended to other lifestyle channels under the Scripps Networks umbrella, like HGTV and Travel Channel.) But it’s paid big dividends for both the network and its stars, creating an environment where familiar faces are around to usher in new shows, formats, specials, and programming paradigms, their mere presence a comforting reassurance that this is the same channel viewers have always known. Except it’s not. Food Network personalities have come and gone, the most prominent being Emeril Lagasse, the chef who helped the network emerge from near-bankruptcy in the mid-’90s. Those who have stuck around for the long haul—Bobby Flay, Mario Batalli, Ina Garten, Giada DeLaurentiis, and Brown, among a few lesser network luminaries—have done so because of their ability to adapt with the channel as it moved from programming model to programming model, searching for the right balance of instruction, entertainment, and education to keep viewers tuned in. Good Eats had that balance from its very first episodes, two half-hour pilots Brown created with his wife DeAnna in 1998 that aired on Chicago PBS affiliate WTTW. Back when Food Network struggled to gain a foothold in the cable rotation, PBS and its affiliates were still considered the default venue for cooking programming, thanks in large part to a long association with Julia Child and The French Chef. Child was one of Good Eats’three main pillars, the trio of influences Brown points to as the inspiration and foundation for his show: Alongside Child—whose “anyone can cook” method is the basis of the instructional cooking show at we know it—were Mr. Wizard (the educational aspect), and Monty Python (bringing the entertainment value). These three pillars are evident in “Steak Your Claim,” the first of the two test shows (technically episode one) that the Browns shot—on film, not video—for $150,000 in 1997. “Steak Your Claim” features an instructional walkthrough of a simple method for cooking steak: a slab of ribeye, oil, kosher salt, and a cast-iron skillet are the only requirements. But Brown doesn’t get to that method until halfway through the episode, when he finally moves in front of the stove. 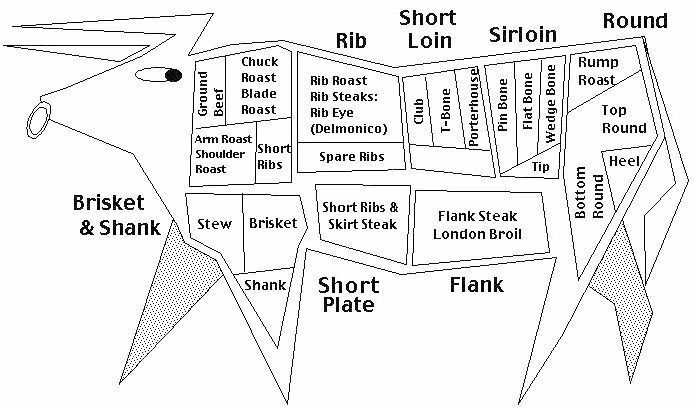 Before that, he’s talking with a rancher in front of the first incarnation of the show’s indispensable beef map, interviewing a butcher on the various cuts of meat home cooks might encounter, and leading a handheld camera through a hardware store in search of a suitable cast-iron skillet. He also dresses up as a USDA agent, spoofs The Twilight Zone (“Submitted for your approval, hundreds of mysterious pieces of meat, each an enigma in shrink wrap”), and defines steer as bulls that, “Let’s just say, they don’t make much time with the ladies.” These are all just hints of the in-depth—sometimes ridiculously in-depth—educational segments and goofy entertainment value that would augment, and sometimes even flat-out replace, Good Eats’ instructional cooking segments. The two test episodes aired and reran a few times on WTTW, but that’s not how they came to the attention of Matt Stillman. A programming developer at Food Network, Stillman ushered Good Eats onto cable the same year he brought the channel another unique take on food programming—and a future phenomenon—in the form of the original Japanese version of Iron Chef. Stillman read about the Good Eats pilot in a film trade magazine—in which it was featured for having used a new type of Kodak film stock—and found Brown and the episodes via the Kodak website. It’s an appropriately backward genesis for a food personality who only went to culinary school after he decided he wanted to make a cooking show. Brown was a cameraman and cinematographer throughout his 20s—he shot the music video for R.E.M.’s “The One I Love”—and decided when he was 30 that he wanted to do something new. Unlike other Food Network personalities who leveraged their time running restaurants and writing cookbooks into TV careers, Brown wanted to make good TV first, and went to culinary school to get the tools he needed to get there. That medium-before-message genesis accounts in part for Good Eats’ singular sensibility: Brown was an expert in the medium (television) before he was an expert in the message (food). His interests expanded well beyond cooking—he dabbled, but it was always more hobby than profession—and would end up imbuing the show he eventually made as much, maybe even more, than the subject at its center. The first words uttered in “Steak Your Claim”—“I think it’s safe to say, John Wayne ate steak”—are indicative of the love of pop culture that’s built into the show’s foundation. The theme song, which threads throughout every episode in any of hundreds of permutations, is inspired by music from Get Shorty, and a glance at the list of episode titles evidences Brown’s love of movies, television, and groan-worthy puns: “Pork Fiction,” “The Egg Files,” “Fry Hard,” “The Big Chili,” “There Will Be Oil,” and so on and so on. He’s done episode-length parodies of Miseryand Castaway that somehow, improbably, still manage to inform and educate about the foods ostensibly at their center (potatoes and tropical cuisine, respectively). Brown and his team certainly created their fair share of great recipes over the years—with Thanksgiving on its way, the Food Network’s website is sure to see increased traffic on Brown’s instructions for brined turkey. But any given episode of Good Eats is less about particular recipes than about the ideas behind those recipes: the scientific concepts behind cooking, yes, but also the history and cultural perceptions behind dishes and ingredients, the tools and methods we use to cook, and often, the flat-out fun of making food. Brown took a sometimes obsessively DIY approach to home cooking on Good Eats: Why buy a food dehydrator when you can make your own out of box fans and air filters? Planning to deep-fry a turkey this Thanksgiving? Better construct an insanely complicated turkey derrick first! Large chunks of Good Eats were often devoted to the alternate methods and homemade contraptions Brown would use, and to a viewer looking for nothing more than a recipe to be implemented, it could come off a little… well, insane. But Brown knew—as did fans of the show—that Good Eats wasn’t just about the how-to of cooking. In the age of the Internet, the home cook has no shortage of options when it comes to finding recipes and methodology—hell, every single recipe featured on Good Eats is available on foodnetwork.com, not to mention Brown’s trilogy of cookbooks inspired by the show. The value of Good Eats is in watching Brown, usually by himself in the kitchen (save the occasional guest star, such as “Santa” on the Christmas cookie episode or “Count Dracula” on the garlic episode), delight in process and minutiae. On Good Eats, cooking isn’t about impressing people with a one-of-a-kind dish or bowling them over with culinary acumen. It’s about being able to really make something, about understanding it at the most basic level and building from there—and then taking it way over the top, if that appeals to you. When The A.V. Club interviewed Brown in 2009, he talked about how self-reliance is very important to him, and that’s evident in Good Eats, which places much more value on understanding a recipe than simply mimicking it. Brown wasn’t just giving viewers a recipe for fish; he was teaching them to fish, to scale and portion that fish, and choose the best method for cooking that fish, so that they might eat forever. Underneath the complex gizmos and jokey foofaraw, almost every episode of Good Eats boils down to one ingredient, or sometimes a process—let’s call it a building block. The show doesn’t maintain the illusion that viewers are following along at home, à la the dump-and-stir instructional shows that came before it, but it isn’t an entirely passive experience, like the current crop of entertainment-minded Food Network shows, either. To watch Good Eats is to take a 22-minute cooking class—a very entertaining, frequently quite silly cooking class, but a generally effective one nonetheless. Like Mr. Wizard and Bill Nye before him, Brown—who wrote, directed, and starred in every episode of Good Eats—was a master of edutainment, of dressing complicated ideas up in foam rubber, dioramas, and deceptively childlike mnemonic devices. Longtime Good Eats viewers probably can’t think of yeast without picturing the burping sock puppets Brown used to represent the wee little beasties, and could probably sketch a reasonable representation of a protein chain or sucrose molecule, thanks to the numerous craft-store-abetted models Brown created over the years. Repetition is key to making an idea stick, and Brown knew that, judging from the recurring catchphrases, models, and characters he trotted out again and again in service of different foods and recipes that were all, in the end, built on the same scientific building blocks. That repetition was useful in terms of education, but it also strongly bolstered to the show’s entertainment value. It’s doubtful someone could watch Good Eats for years without absorbing at least a little culinary knowledge, but even if they didn’t, they’d at least be well versed in the unique little world of Good Eats. Not many cooking shows bother with things like world-building, but Good Eats exists in its own universe, one as distinctive and well-defined as those of many narrative series. There’s the character of “Alton Brown” at the center—not far removed from the actual Brown, but with a certain lovable, crazy-recluse vibe tacked on—but also an established cast of supporting players both fictional (kitchen-gear specialist “W,” disembodied helping hand Thing, long-suffering intern/assistant Paul) and real (nutritional anthropologist Deborah Duchon, dietitian Carolyn O’Neil, a.k.a. “The Lady Of The Refrigerator,” and other various experts and food professionals). And while Brown’s kitchen set serves as the nexus of the show, his fictional home sprawls into a bunch of nooks and crannies of dubious verisimilitude, including a dungeon basement (where Igor lives, ready to provide his master with implements of culinary torture, such as meat tenderizers and tortilla presses) and a virtual-reality chamber where Brown can practice his ordering skills at a fictional sushi restaurant. Then there are the countless recurring phrases and gags and callbacks—not to mention more Dutch angles than you can shake a wooden spoon at—enough for the show to warrant its own extensive page on TV Tropes. None of these things are necessary, or arguably even very desirable, on a cooking program, but they all contribute to the sense of play at the heart of Good Eats. Good Eats’ debut was part of Food Network’s official “relaunch” in June of 1999, alongside other new programs like Iron Chef, Hot Off The Grill With Bobby Flay, and East Meets West With Ming Tsai. (The massively popular Emeril Live premiered two years prior. )All were indicative of the network’s move away from the staid, sober approach to cooking shows and toward a more entertainment-minded model. And it worked like gangbusters. By the end of that year, Food Network was in 40 million homes, and boasted a 50 percent increase in number of viewers over the previous year. (Today, it’s in more than 90 million homes.) For years, Good Eats was an integral part of the channel’s primetime lineup, running new episodes on Wednesday nights and reruns throughout the day and overnight. Even when major successes like Throwdown! With Bobby Flay and Food Network Star prompted the network’s slide into competition- and spectacle-based programming, Good Eats held on, essentially unchanged since its debut, outside of a fancier kitchen set and an upgrade to high-def. With its pop-cultural and comedic bents, it was better equipped to handle the network’s shift toward attracting a less food-centric audience than something like Emeril Live, which succumbed to the winds of change in 2007. Even those who would never make a homemade food dehydrator could find entertainment value in the goofy guy in Hawaiian shirts (or, after his dramatic weight loss, colorful plaids and loud bowties) making corny yet self-aware puns and movie references. And those who did want those educational and instructional aspects could still find them on Good Eats, as those things became increasingly scarce throughout the rest of the network’s primetime lineup. Television is an adapt-or-die business, so it’s no surprise that Food Network has abandoned its niche interests to embrace a broader lifestyle brand—it would actually be far more surprising if it hadn’t. And it’s not like there aren’t other places on the cable spectrum, like Cooking Channel, where the original spirit of Food Network lives on. The nice thing about cooking shows is that they don’t really have an expiration date, and Good Eats is no exception, minus the occasional dated reference here and there; watching the show today is as informative, educational, and entertaining as it was in the early 2000s when it was groundbreaking food-based television. But in watching reruns on Food Network—when you can find them—there’s an increasing sense of nostalgia that creeps in as the channel moves further and further away from a programming model that would tolerate, much less nurture, something like Good Eats. Today, the show looks like both a relic of Food Network’s instruction-minded past and a harbinger of its entertainment-minded present. But, in the parlance of the show, through it all it remains… Good Eats.